This dish is actually two separate recipes, both of which are all-day, long cooking kinda foods. I posted the cranberry bean recipe on January 3, when I made the beans that became part of this dish. It makes a large batch, so I simply froze some for later. 1. Soak wheatberries and rice together for 1 hour with water to cover. Rinse and drain, and place in a large pot or Dutch oven. Add kombu, soy sauce or tamari, and water. Cover and bring to a boil. 2. When the grains begin to boil, add the vegetables in the order listed. Cover, reduce heat, and simmer for 2 to 2-1/2 hours. Remove from the heat and stir in beans. Yesterday didn’t turn out at all as planned. After writing and publishing my post for the day, I went to put the chickpeas in the crock pot only to find the chickpea container sadly empty of anything but a few dusty flecks. WTF?! It was terrible. But, in a testament to my newly acquired, almost-daily yoga regimen, which really has made me a lot less likely to freak out and more likely to keep breathing, I quickly rallied and went for the not-empty container next door. Cranberry beans. Outside the baby lima and Crowder beans I ate growing up, cranberry beans were my introduction to the world of fresh beans. I first saw them about 15 years ago, at a farmer’s market in Chicago. There was a giant pile of gorgeous, red and white speckled pods, each filled with plump, red and white speckled beans. I stuffed a bag full, went home, and entered a new world of culinary experience. It was simple. 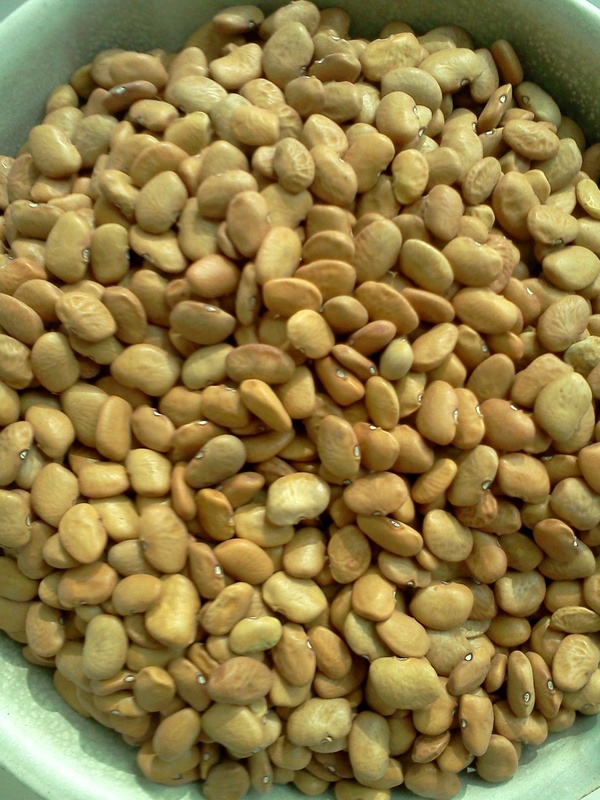 I shelled the beans, boiled them for about 10 minutes in salted water, then tossed with butter. The cooked beans had lost the speckles. Yet it didn’t matter. They were, at that moment, the very best thing I had ever tasted,with a fresh and earthy flavor, a firm yet tender bite, and a creamy, almost meaty texture. Yum! It was hard to believe I’d gone my whole life up ’til then without even knowing such a thing existed. Fast forward to now, 2013, when cranberry beans are a staple in my life. I’m lucky to live in a place where it’s super easy to find almost every kind of food. A neighborhood market stocks the Goya brand of dried beans, which includes a variety of cranberry beans that are sold as “Roman” beans. I typically use them for vegetarian chili as a substitute for pinto beans. But I also love them on their own. My favorite way to eat fresh cranberry beans is still super simple, as described above. But dried cranberry beans star in this recipe from Skye Gyngell’s My Favorite Ingredients. I’ve adapted her original recipe for the crock pot and added kombu. While Gyngell provides directions for both fresh and dried beans, the following recipe calls for dried beans. Yesterday, which is when I actually made this dish, I did not soak the beans. I generally don’t. When I first started cooking beans, I thought it was mandatory. There was no room in my life for such a thing as spontaneous cooking with dried beans. But as time passed and I grew more comfortable, I relaxed. I learned that soaking wasn’t necessary. Indeed, as I mentioned yesterday, I grew to believe that soaking was actually a bad idea. Now I’m not so sure. After reading yesterday’s post, a friend who is studying nutrition commented that “soaking beans makes them more easily digested and nutrients more bioavailable. Beans (nuts, seeds) have a hard exterior shell because their goal is to prevent digestion so they can be replanted in the earth to grow. By soaking the beans, you are breaking down some of that phytic acid (tannins, carbs, etc) and encouraging full absorption of vitamins, minerals, and proteins. Better yet? Soak beans in warm water with a bit of acid (lemon juice, vinegar) for 24 hrs+ and the beans will start to sprout. This means the tough exterior is breaking open PLUS enzymatic activity increases in the (now) living plant. In my experience, this takes at least a few days (switching out the water occasionally to re-warm/re-acidify) and is harder to do with tight beans (ie: black).” I’m not sure about the acid soak yet, as I haven’t tried it. But I’m thinking I will go back to soaking, at least when I think ahead of time. However, my soaking technique will be a little different from what it was before. I’m going to follow Steve Sando’s advice, which is to soak for 2 to 6 hours and then cook the beans in the soaking water. I’ll let you know how it turns out the next time I make a pot o’ beans. For now, here’s the recipe for what I made yesterday. Place all ingredients in insert of crock pot. Cover with 1-1/2 to 2 inches of cold water. Cook on low for 8 hours or high for 4. If you aren’t using a crock pot, preheat the oven to 400 degrees. Combine all ingredients in a dutch oven and add water to cover by 1 or 2 inches. Cover tightly, either with a lid or with foil, and bake until the beans are tender. This will likely take 1-1/2 or 2 hours. Remove from the oven or turn off the crock pot, stir well to combine, and salt to taste. Then let the beans cool to room temperature in the liquid. As Gyngell says and as I’ll attest, “[t]he beans should be full of the flavors with which they have been cooked and allowing them to stand will enhance this further.” The last time I made this I served it as a side with roasted rack of lamb, potato-celery root latkes, and an arugula salad with fennel, blood orange, and avocado. The beans are also a substantial main course with bread and a salad. I’ve also been known to eat a bowl on their own as a snack or an emergency meal. Beans are good fuel.